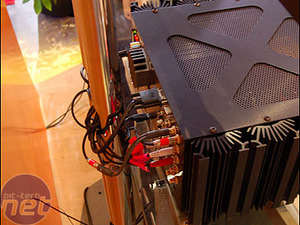 Dolby is continuing to work hard to crack open the PC market and get its approved sound systems into PCs and motherboards from manufacturers. With the logo programme - Master Studio, Home Theatre, etc - consumers are starting to get the hang of what is going to be a decent audio experience when it comes to computer hardware. Keith Kowell, Dolby PC audio guru extraordinaire, told bit-tech that he expected to see more mobos and laptops with the certification in 2007. With Vista on the horizon, so to speak, a new set of drivers developed in conjunction with SigmaTel is delivering ease of use and configuration to people setting up their sound system, and Vista work will continue well on into the year. We loved the Master Studio system below from Niveus - it's completely passive inside (hence the fact the case looks like a big heatsink) and it looks, and sounds (or doesn't), spectacular. 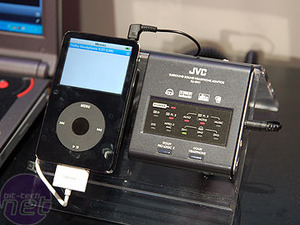 Also on display was a little box from JVC that adds Dolby Headphone to any stereo input, and there was plenty of noise, so to speak, about TrueHD - the lossless audio standard for Blu-ray and HD-DVD that we are seeing on new discs. It really does sound fantastic in 7.1, as our test in the office can attest, and we can't wait until games start getting to the point where lossless soundtracks are an option. Halo 3, anyone? We can but pray. One of the firm's big announcements this week has been the news of Dolby Volume. This is a new product in the lineup, and it aims to solve a pretty simple problem - volume spikes. Ever been watching a quiet TV programme only to be blown out of your seat by loud ads? Volume goes way beyond simple audio level compression and uses algorithms developed to work in the same way that you hear, giving you a much more pleasurable experience. What kind of speaker set up do you have, and do you think Dolby Volume could be useful? Let us know your thoughts over in the forums. 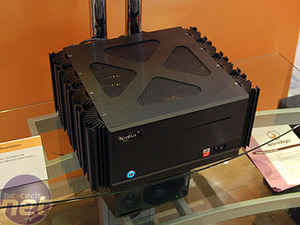 Niveus passive media PC with AV outputs. 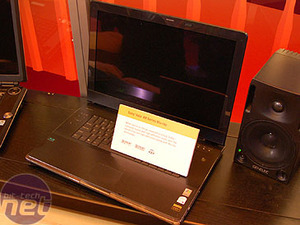 JVC Dolby Headphone unit and Sony Home Theater laptop with Blu-ray. We try out Shure's new entry-level in-ear headphones, which come in at just under £55. Are they worth the cost considering you'll just cover them in wax? We find out by testing them out on some slammin' tunes!